A 56-year-old man presents with a 2-month history of increasing anterior knee pain of the left leg without previous trauma. Imaging and histology confirm a benign primary aneurysmal bone cyst. Anterior knee pain is usually an insistent but harmless symptom . Rarely, it is caused by severe conditions such as bone tumors [2-4]. Most bone tumors affecting the patella are benign lesions, with giant cell tumor of bone and chondroblastoma being the most common [2,4,5]. The occurrence of aneurysmal bone cysts (ABCs) in the patella is anecdotal [6-11]. Most published cases describe “latent” (stage I) or “active” (stage II) lesions according to the staging system of benign skeletal tumors by Enneking . Aggressive (stage III) lesions as presented here occur even more rarely . The subject of this report gave informed consent that the data of this case would be submitted for publication. 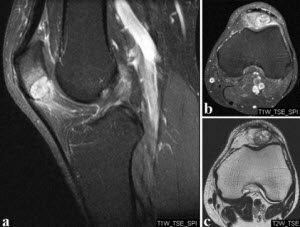 In May 2008, a 56-year-old man presented at our outpatient clinic with a 2-month history of increasing anterior knee pain of the left leg without previous trauma. The patient did not perform any sports on a regular basis. Physical examination revealed a full active and passive range of motion of the left knee, but maximal flexion was painful. There was no effusion or swelling but moderate tenderness on palpation of the inferior pole of the patella. Physiotherapy with stretching exercises of the quadriceps muscle did not improve symptoms. Magnetic resonance imaging (MRI) was performed and showed a hyper-intense lobulated mass with small fluid-filled cavities at the inferior pole of the patella (Figure 1). An additional CT scan revealed an osteolytic lesion with endosteal scalloping and cortical thinning (Figure 2). Figure 1. Magnetic resonance imaging of the left knee. MRI of the left knee showing a hyperintense lesion within the inferior pole of the patella – (a) sagittal T1, (b) axial T1, and (c) axial T2-weighted sequences. Figure 2. Computed tomography of the left knee. CT scan of the left patella showing an osteolytic lesion within the inferior pole of the patella. Note the cortical thinning/breakthrough as a sign for the aggressiveness of the lesion – (a) sagittal, (b) axial sequence. In June 2008, the patient was referred to a musculoskeletal tumor center where a biopsy was performed according to the guidelines of the Musculoskeletal Tumor Society . 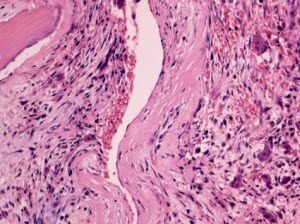 Histology showed bony fragments with fibrohistiocytic proliferations, loosely arranged spindle cells, and several multinuclear giant cells. The cavernomatous spaces were lined with endothelial cells and contained red blood cells (Figure 3). Figure 3. Histology sample. Histology sample showing a typical picture of aneurysmal bone cyst. Hematoxyline-Eosine stain, 20×. Cavernomatous spaces lined with endothelial cells and containing extravasated red blood cells. Note the multinucleated giant cells. Although the typical fluid-fluid levels on the MRI were not visible, the tumor was diagnosed as a benign primary aneurysmal bone cyst (ABC). Curettage with burring and bone grafting was recommended but the patient deferred the surgery to September 2008 for occupational reasons. Because of the long interval between diagnosis and treatment, we performed another CT scan of the patella in September 2008 that showed a significant progression of growth from initially 2.5 ml (Figure 4a and b) to approximately 9 ml (Figure 4c and d) with cortical breakthrough. Figure 4. CT-scans with three-dimensional reconstruction and volume analysis. Three-dimensional reconstructions of CT-scans showing the significant progress of the lesion from May (a and b) to August 2008 (c and d). Surgery revealed a lobulated cavity filled with a mixture of blood and solid red tissue, as well as a fracture of the cortex at the inferior patellar pole, with the covering cartilage still intact. We performed intralesional curettage through a lateral approach with additional high-speed burring and lavage with hydrogen peroxide. Due to the aggressiveness of the lesion, we decided to fill the cavity with bone cement instead of bone graft to reduce the likelihood of recurrence. Histology confirmed the initial diagnosis of benign ABC. The further treatment consisted of full weight-bearing of the left leg and physiotherapy to regain full range of motion. At last follow up in February 2010, the patient was free of complaints and had a full range of motion. The standard radiographs showed regular placement of the bone cement without evidence of local recurrence (Figure 5). After 17 months, the inferior cortex is remodeled (Figure 5a), but there are also degenerative changes in the femoropatellar joint (Figure 5b). However this did not cause clinical symptoms. The Knee Society Score, the Lysholm Score and the WOMAC Osteoarthritis Index showed excellent results, with 100 points each. Figure 5. Radiographs of the left patella after bone cement packing. Radiographs of the patella 17 months after surgery. The small X-rays were performed 1 week after filling of the cavity with bone cement. Note the lack of the inferior cortex of the patella (a, left), which is remodelled at last follow-up. The image at the right shows degenerative changes at last follow-up, but without clinical symptoms. Anterior knee pain is a common clinical symptom that can be related to a variety of anatomic structures, such as patellofemoral cartilage, anterior capsule, subchondral bone, synovial tissue, infrapatellar fat pad, and patellar tendon . The pain may be caused by a number of disorders, including patellar tendonitis , hypertrophic synovial plicae, or so-called chondromalacia patellae . In most cases, no specific cause is identified. However, anterior knee pain may also be the first symptom of a bone tumor. Primary intraosseus lesions of the patella are very rare, and a number of differential diagnoses need to be considered [2-4]. The majority of these lesions are benign with giant cell tumor of bone and chondroblastoma being the most common diagnoses [2,4,5]. Aneurysmal bone cysts account for 1% to 2% of all primary bone tumors, usually present in the first two decades of life, and exhibit a slight female preponderance . ABCs are usually osteolytic lesions consisting of a lobulated blood-filled cavity including giant cell-rich soft tissue. On standard radiographs they present as an osteolytic lesion. Magnetic resonance imaging typically shows fluid-fluid levels, ABCs usually occur within the metaphyses of the long bones; affection of the patella is seldom [6-11]. Most reported ABCs of the patella are stage I or II lesions [6-9,11]. Due to cortical breakthrough, our case is referred to as a stage III lesion. The generally recommended treatment consists of curettage and autogenous bone grafting for stage I and II lesions, sometimes with chemical adjuvants added [16,17]. Some authors recommend wide resection/total patellectomy for stage III lesions . Because the typical fluid-fluid levels were not visible in the MRI, we performed an open biopsy to exclude any malignancy. Finally, we treated our patient with curettage, additional burring with a high-speed burr, and lavage of hydrogen peroxide. Due to the aggressiveness of the lesion, we decided to use bone cement packing as an additional adjunct. This combination has been shown to significantly reduce the local recurrence rate in biologically comparable tumors such as giant cell tumors of bone . Despite the cortical breakthrough, total patellectomy or resection of the inferior patellar pole seemed to be an over treatment, especially because the main retropatellar surface was not affected. At last follow-up 1 year after surgery, the patient was free from complaints and without any signs of recurrence. In conclusion, although anterior knee pain is a usually harmless symptom, it is essential to consider that it might also be caused by more severe disorders such as bone tumors. Maurice Balke is from the Department of Trauma and Orthopedic Surgery, University of Witten-Herdecke, Cologne-Merheim Medical Center, Cologne, Germany. Nicolas Dedy, Dennis Liem, and Jendrik Hardes are from the Department of Orthopaedic Surgery, University Hospital Muenster, Muenster, Germany. Jonas Mueller-Huebenthal is from the Department of Radiology, Cologne Triangle, Cologne, Germany. Juergen Hoeher is from the Division of Sports Medicine, Trauma Department, Hospital Cologne-Merheim, Cologne, Germany. Balke M, Dedy N, Mueller-Huebenthal J, Liem D, Hardes J, Hoeher J. Uncommon cause for anterior knee pain – aggressive aneurysmal bone cyst of the patella. Sports Medicine, Arthroscopy, Rehabilitation, Therapy & Technology 2010, 2:9 doi:10.1186/1758-2555-2-9. © 2010 Balke et al; licensee BioMed Central Ltd. This is an Open Access article distributed under the terms of the Creative Commons Attribution License, which permits unrestricted use, distribution, and reproduction in any medium, provided the original work is properly cited. Donati D, Zavatta M, Gozzi E, Giacomini S, Campanacci L, Mercuri M: Modular prosthetic replacement of the proximal femur after resection of a bone tumour a long-term follow-up. J Bone Joint Surg Br 2001, 83:1156-1160. Ferguson PC, Griffin AM, Bell RS: Primary patellar tumors. Clin Orthop Relat Res 1997, 199-204. Singh J, James SL, Kroon HM, Woertler K, Anderson SE, Davies AM: Tumour and tumour-like lesions of the patella–a multicentre experience. Eur Radiol 2009, 19:701-712. Balke M, Schremper L, Gebert C, Ahrens H, Streitbuerger A, Koehler G, Hardes J, Gosheger G: Giant cell tumor of bone: treatment and outcome of 214 cases. J Cancer Res Clin Oncol 2008, 134:969-978. Oh JH, Kim HH, Gong HS, Lee SL, Kim JY, Kim WS: Primary aneurysmal bone cyst of the patella: a case report. J Orthop Surg (Hong Kong) 2007, 15:234-237. Faris WF, Rubin BD, Fielding JW: Aneurysmal bone cyst of the patella. A case report. J Bone Joint Surg Am 1978, 60:711. Castro MD, Irwin RB: Aneurysmal bone cyst of the patella. Am J Orthop 1996, 25:717-719. Pevny T, Rooney RJ: Case report 876: Aneurysmal bone cyst of the patella. Skeletal Radiol 1994, 23:664-667. Copeland CX Jr, Enneking WF, Robbins WJ: Aneurysmal bone cyst of the patella. A report of two cases. Clin Orthop Relat Res 1966, 45:145-150. Reddy NS, Sathi VR: Primary aneurysmal bone cyst of patella. Indian J Orthop 2009, 43:216-217. Enneking WF: A system of staging musculoskeletal neoplasms. Instr Course Lect 1988, 37:3-10. Mankin HJ, Gebhardt MC, Jennings LC, Springfield DS, Tomford WW: Long-term results of allograft replacement in the management of bone tumors. Clin Orthop Relat Res 1996, 86-97. Duri ZA, Aichroth PM, Wilkins R, Jones J: Patellar tendonitis and anterior knee pain. Am J Knee Surg 1999, 12:99-108. Bentley G: Anterior knee pain: diagnosis and management. J R Coll Surg Edinb 1989, 34:S2-3. Mendenhall WM, Zlotecki RA, Scarborough MT, Gibbs CP, Mendenhall NP: Giant cell tumor of bone. Am J Clin Oncol 2006, 29:96-99. Mankin HJ, Hornicek FJ, Ortiz-Cruz E, Villafuerte J, Gebhardt MC: Aneurysmal bone cyst: a review of 150 patients. J Clin Oncol 2005, 23:6756-6762.